Draft: 2000, Pittsburgh Pirates, 3rd rd. Made KC's Opening Day roster and appeared in 14 games (two starts), posting a 7.50 ERA (25 ER, 30.0 IP)...Went scoreless in five of his 12 appearances as a reliever, posting a 6.17 ERA...worked a career-high 5.0 IP in relief on 5/21 at MIN, allowing three runs in KC's 8-4 defeat...Made back-to-back starts on 5/9 at TB and 5/14 vs. BAL, posting a 12.15 ERA (9 ER, 6.2 IP) as a starter...Designated for assignment on 6/23. Appeared in 34 games, making 13 starts, going 3-9 with a 6.19 ERA in 88.2 innings...Opened the season in the starting rotation, before being placed on the 15-day disabled list with a right forearm strain on May 12…pitched exclusively out of the bullpen from July 10 to the end of the year...Matched a career high with 28 home runs allowed… surrendered at least one homer in all 13 starts and just two in his relief appearances...Surrendered a .291 opponents' average (104-for-357), the highest he's allowed in any one season…it was the sixth-highest opponents' average by any AL pitcher that threw at least 80.0 innings...Recorded a career-high three pickoffs, matching his total from his previous four big league seasons (2010-15)...Posted a 1-8 mark with a 7.39 ERA (46 ER in 56.0 IP) in his 13 starts…comparatively, he was 2-1 with a 4.13 ERA (15 ER in 32.2 IP) in his 21 appearances out of the bullpen...Dropped each of his first three starts, matching his longest losing streak since July 4-18, 2012 with San Diego...Earned his first win on April 22, recording a season high 10 strikeouts vs. Baltimore…it marked his first outing with double-digit strikeouts since April 24, 2008 vs. San Francisco (also 10), with San Diego...Surrendered five solo home runs in a 6-3 loss at Yankee Stadium on May 9… became the first Major Leaguer to allow five homers in a single outing since Mat Latos did it over 7.1 innings vs. Colorado on May 27, 2012...Also allowed four home runs on June 5 at Cleveland and July 5 at Toronto…he's the fifth MLB pitcher to yield at least four homers in a game three times in a season...Accounted for a team-high 7.1 scoreless innings during the bullpen's franchise-record 41.1 scorelessinning streak from Aug. 10-26...Earned his first career save on Aug. 14, working the final 3.0 innings of an 11-4 victory at Target Field… at 37 years, 81 days old, he became the oldest Royal to record a save since Roberto Hernandez (37 years, 312 days) in 2002...Had successful bilateral core and right-sided adductor repair in a procedure performed by Dr. Bill Meyers on Oct. 11. Chris signed a two-year free agent contract on December 8, 2015, with a mutual option for the 2018 season. • Posted an 8-6 record with a 3.18 ERA as a starting pitcher and a 3-0 mark with a 2.59 ERA in 16 relief outings...Among pitchers that worked at least 100.0 innings, his .202 opponents' average was the lowest in the American League and was good for fourth in MLB…among that group, he also had the fourth-fewest hits allowed per 9.0 innings (6.64)...Went 5-2 with a 2.52 ERA (18 ER in 64.1 IP) in 20 outings and nine starts on the road…opponents hit .189 against him at their home parks, which was the second-lowest in the A.L., behind Cleveland's Carlos Carrasco (.179)...Posted a 2.12 ERA and a 2-1 record in four appearances (three starts) in Interleague play...He also had a 1.13 ERA and a .167 opponents average vs. A.L. West foes this season, earning a victory at Oakland on June 27...Named the Royals Pitcher of the Month for May, going 3-1 with a 1.45 ERA and a .179 opponents' batting average...Had two starts of 5.0 innings where he did not allow a hit, May 1 in a 4-1 win over Detroit and September 27 vs. Cleveland, a 3-0 triumph...Posted a 3-0 record and a 2.28 ERA over his final 12 outings of the year, which included two starts and 10 relief appearances...allowed one run or less in 12 of 15 appearances after the All-Star break (3.22 ERA)...Collected two hits and drove in three runs in his start at Milwaukee on June 16…his three RBI were the most by a Royals pitcher since 1972 when Steve Busby did it against the Angels…he was also just one of three American League pitchers to record at least three RBI in a game since Interleague play began in 1997 and first since former teammate Felix Hernandez had four RBI at Citi Field on June 23, 2008...Appeared in four games, making two starts, during the postseason…posted a 2.87 ERA (5 ER in 15.2 IP), which ranked second among all participants that worked at least 15.0 innings...his .157 opponents' average led that group...Set a Royals postseason record, collecting seven strikeouts in 4.0 innings of relief in Game #1 of the ALDS vs. Houston…his total was also tied for most by a reliever in a postseason game since Pedro Martinez fanned eight in a relief role in Game 5 of the 1999 ALDS vs. Cleveland...Earned his second career postseason win in Game 1 of the World Series, tossing 3.0 scoreless innings in KC's 5-4 win over the Mets in 14 innings...Became the oldest Royal to start a World Series game (36 years, 159 days), working the first 4.0 innings in Game 4 of the Fall Classic at Citi Field. Went 1-2 with a 6.81 ERA in 9 minor-league starts, all within the Nationals system...signed with Washington during Spring Training, went 1-0 with a 2.25 ERA in 4 Graefruit League starts, then elected free agency...resigned with Washington 8 days later...underwent right shoulder thoracic outlet decompression proceedure, performed by Dr. Robert Thompson, on June 11. In most extensive action since '07, posting a 4.15 ERA in 20 starts for the Mets...signed late (March 26) and went 1-0 with a 2.35 ERA in 4 starts before having contract selected by NYM on June 5...went without a win at Citi Field despite posting 7 quality starts in 8 starting assignments there. Underwent season-ending surgery to repair a tear in the anterior capsule of his right shoulder on May 16...The surgery was performed at the Hospital for Special Surgery and was conducted by Mets Medical Director, Dr. David Altchek...Placed on the 15-Day Disabled List on April 16 with right bicep tendinitis...Transferred to the 60-Day DL on June 3...Last appeared in a game for New York on May 1...Earned a no-decision in a 2-1 Mets victory at Philadelphia...Pitched 7.0 scoreless innings and allowed two hits and three walks...The start marked the ninth time since 2005 in which he pitched at least 7.0 innings, while giving up no runs and two or fewer hits...The nine starts are tied with Jake Peavy for the most such starts among pitchers over that span (2005-2011)...Tied a season-high with seven strikeouts on May 1 at Philadelphia...Also had seven strikeouts over 5.1 innings in his first start on April 5 at Philadelphia...Won that game, 7-1...Held opposing hitters to a .146 (12-82) batting average, as well as a .083 (1-12) average in the first inning in his four starts...Among active pitchers who have thrown at least 750.0 innings, his .218 (626-2868) career batting average against is the fourth-lowest...Possesses the lowest hits-per-nine-innings ratio (6.27) mark in the Major Leagues among pitchers who have made at least 15 starts since May 2, 2009...Became the first Mets pitcher in franchise history to collect two hits in one inning when he singled twice off Cole Hamels in the third inning on April 5at Philadelphia...San Francisco's Madison Bumgarner was the last pitcher with two hits in an inning when he did it on September 23, 2010 at Chicago (NL)...Also became the first player to record two hits in an inning in his first game with a team since Adam LaRoche did it for the Braves against the Mets on April 7, 2004...The last pitcher to accomplish the feat was Dustin Hermanson for the Cardinals at Arizona on April 6, 2004...Young finished the game with three hits to equal the franchise record for hits in a game by a pitcher...The last Mets pitcher to collect three hits in a game was Tom Glavine on August 11, 2005 at San Diego. Spent the majority of the season on the Disabled List with a strained right shoulder, making just four starts for the Padres...Made the start in the Padres' second game of the season on April 6 at Arizona, picking up San Diego's first win of the year after working 6.0 scoreless innings of one-hit ball...Placed on the 15-day Disabled List on April 12 with a strained right shoulder after making his first start...Had one rehabilitation start for San Antonio (AA) of the Texas League on May 2...Transferred to the 60-Day Disabled List on May 17...Made two rehabilitation starts for Portland (AAA) of the Pacific Coast League on August 31 and September 5...Made his third and final rehabilitation start on September 11 for Lake Elsinore (A) in Game One of the California League playoffs, earning the win after working 5.2 shutout innings...Posted a 0.75 ERA (one run and five hits in 12.0 innings) over his three rehab starts from August 31-September 11...Reinstated from the 60-Day DL on September 18 to make the start at St. Louis...Worked 4.0 innings of one-run ball in the Padres 8-4 victory...Went 1-0 with a 1.29 ERA (two earned runs/14.0 innings pitched) and a .180 (9-50) opponents batting average in three starts from September 18-September 29, with the Padres winning each of his starts...Held righthanded hitters to a .130 (6-46) opponents average while lefthanders hit just .167 (4-24) off him...Was 2-0 with a 3.32 ERA in six Spring Training starts. 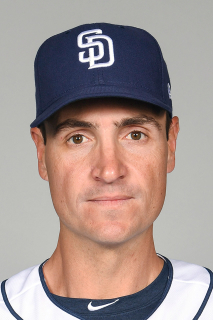 Made 14 starts before missing the second half of the season with a strained right shoulder...placed on the 15-day disabled list 6/19 (retroactive to 6/15) and transferred to the 60-day on 7/31...Made just 14 starts before missing the second half of the season...Padres went 6-8 in his outings...won his first two starts, allowing three runs (two earned) over 13.0 innings...Had six starts in which he surrendered two or fewer runs...five starts with five or more runs allowed...Allowed a .246 opponent average while striking out 50 and walking 40...Surrendered a career-high four home runs on two occasions (5/13 at CHI; 6/9 at LAD)...Underwent arthroscopic surgery on his right shoulder 8/17...surgery performed by Dr. Heinz Hoenecke and Dr. Daniel Keefe at Scripps Clinic in Carmel Valley. Missed 77 club games over two stints on the disabled list...went 7-6 with a 3.96 ERA (45 ER/102.1 IP) in his 18 starts...limited opponents to a .221 batting average (84-for-380), including .189 (39-for-206) vs. right-handed batters...struck out 93 compared to 48 walks...received the Padres Chairman's Award for contributions to the community...Yielded a .186 clip (18-for-97) to batters leading off an inning, .188 (12-for-64) with runners on with two outs, .215 (17-for-79) with runners in scoring position, .182 (8-for-44) with RISP with two outs and .125 (1-for-8) with the bases loaded..Recorded his fifth career double-digit strikeout game 4/24 vs. SF, striking out a season-high 10 batters...Placed on the 15-day DL 5/22 with a nasal fracture and laceration to his nose...sustained the injury when hit by an Albert Pujols line drive in the third inning 5/21 vs. STL...had successful surgery at Scripps Green Hospital to correct a deviated septum and repair a nasal fracture on 6/30...reinstated from DL 7/29...Tossed 5.0 scoreless frames 7/29 vs. ARI and 7.0 shutout innings 9/20 at WSH...10-0 (Padres 13-2) when throwing 5.0 or more scoreless innings since joining San Diego in 2006...15-0 (teams 19-3) in career when going 5.0 or more frames and not allowing a run...On the 15-day DL again on 8/14 (retroactive to 8/11) with a strained right forearm...reinstated prior to his start on 9/1...Tossed his first career complete game 9/7 at MIL, allowing one run over 9.0 innings...threw 7.2 perfect frames before giving up a home run to Gabe Kapler...the 7.2 perfect innings marked the longest perfect outing for a Padres pitcher, passing the mark of 7.1 set by Bob Owchinko on 7/16/77 in a loss vs. the Dodgers (Elias)...finished with one run allowed on two hits with five strikeouts in San Diego's 10-1 win...also collected a double and RBI with the bat...Won three of his final four starts, posting a 1.55 ERA (5 ER/29.0 IP) from 9/7-27...3-1 over that stretch, tossing at least 6.0 innings in each of those outings and yielding three runs or less...Knocked his first career home run, a solo shot 9/20 at WSH off John Lannan. SUMMARY: Finished the 2007 season with a 9-8 record and a 3.12 ERA (60 ER/173.0 IP)...tallied a career-high 167 strikeouts and 72 walks...held opponents to a Major League-best .192 average (118-for-616), including a .155 (50-for-322) right-handed opponents average against...was winless in his final 11 games, 7/24-9/29 (San Diego 3-8), with a 5.75 ERA (36 ER/56.1 IP)...notched four quality starts during the 11-game span and received just 19 runs in support in the 11 outings...did not lose a game over 12 starts from 5/18-7/24, posting a 1.00 ERA (8 ER/72.1 IP) and 5-0 record during that span (Padres 9-3)...had his best month in May, going 4-1 with a 1.13 ERA (5 ER/40.0 IP), 39 strikeouts and 13 walks. WHERE HE FINISHED: Led the Majors with a .192 opponents batting average against (118-for-616) and 1.69 ERA (16 ER/85.1 IP) at home...finished among National League leaders in ERA (5th, 3.12), night ERA (7th, 3.07) and strikeouts per 9.0 innings (T-3rd, 8.7). HOME SWEET HOME: Posted a Major League-best 1.69 ERA at home (16 ER/85.1 IP), finishing with a 4-2 record at PETCO Park while the Padres were 8-5 in his 13 home starts...allowed just one home run at home while holding opponents to a .170 average (50-for-294)...did not allow a run at home over four starts, 6/23-8/15 (27.0 IP), tossing 7.0 shutout innings in each of three contests at PETCO Park, 6/23-7/19, and 6.0 scoreless frames 8/15 vs. COL...home scoreless streak was snapped at 28.0 on 8/30 vs. ARI when Mark Reynolds hit a two-run homer in the second inning. INJURY TIME OUT: Was on the 15-day disabled list from 7/29 (retroactive to 7/25) until 8/9 due to a strained left oblique...suffered the injury on 7/24 at COL, leaving that game after 2.0 innings...left his 8/21 start in New York after 5.0 innings with lower back tightness...missed his next scheduled start 8/26 at PHI. MIDSUMMER DREAM: Earned his first All-Star appearance as the National League's leading vote getter on the Monster 2007 All-Star Game Final Vote...suffered the defeat in the 5-4 loss to the American League, allowing Ichiro Suzuki's two-run, inside-the-park-homer in the fifth inning...allowed one hit and a walk in 1.0 inning. KEEPING THEM IN THE PARK: Worked 80.2 homerless innings (315 batters faced) over parts of 13 games, 5/1-7/14...according to the Elias Sports Bureau, the 80.2 innings was the third longest homerless streak in the Majors this season, behind the Nationals Saul Rivera's 86.1 innings and teammate Jake Peavy's 84.0 homerless frames...allowed two long balls to Arizona's Tony Clark (fourth and sixth innings) on 4/26 at ARI and did not surrender a homer again until Clark knocked a solo shot in the fifth inning 7/14 at ARI. 1-0 WONDERS: Was the starting pitcher in all five of San Diego's 1-0 wins in 2007...earned the win in two of the contests, with 7.0 innings of four-hit ball 4/9 vs. SF and 7.0 frames of two-hit ball 7/19 vs. PHI...did not receive a decision in the club's 1-0 wins 6/5 vs. LAD, 6/16 at CHC and 7/4 vs. FLA, tossing 7.0 shutout frames in each of his starts on 6/5 and 7/4...pitched only 3.0 innings in an eventual 1-0 Padres victory 6/16 at Wrigley Field and was ejected by home plate umpire Mike Everitt after hitting Derek Lee with a pitch to lead off the fourth inning...dropped the appeal of his five-game suspension on 7/5, completing the suspensionon 7/13. END OF THE ROAD: His 9-3 loss on 4/15 at LAD snapped a nine-game road winning streak in addition to his Major League-record tying mark of 25 straight road outings without a loss (9-0, 25 GS, 3.14 ERA, 50 ER, 143.1 IP)...that defeat against the Dodgers was his first away from home since a 5-1 loss with Texas on 6/20/05 at LAA...the undefeated streak began on 6/25/05 at HOU (with Texas)...only Allie Reynolds had gone as many as 25 road starts without a loss, spanning the 1948-49 seasons (Elias Sports Bureau)...his .692 (18-8) career winning percentage on the road is still the best mark among active hurlers with at least 40 road starts. SUMMARY: Acquired in the offseason from the Texas Rangers with Adrian Gonzalez and Terrmel Sledge in exchange for Adam Eaton, Akinori Otsuka and Billy Killian...finished 11-5 with a 3.46 ERA (69 ER/179.1 IP) in 31 starts...made his Padres debut April 7 vs. Colorado...tossed 5.1 innings, allowing four runs on four hits while striking out seven...named National League Pitcher of the Month for June, his first time receiving the honor...went undefeated in the month, going 3-0 with a 1.17 ERA (4 ER/30.2 IP) in five starts...recorded 34 strikeouts compared to 13 walks...finished atop the NL with a .206 opponent batting average. ROAD WARRIOR: Went 6-0 on the road with a National League-best 2.41 ERA (25 ER/93.1 IP) in 15 starts...he is 9-0 with 15 no-decisions in his last 24 starts on the road dating back to June 25, 2005 at Houston (while pitching with the Rangers)...only two other pitchers in Major League history have gone as many as 23-straight road starts without a loss...Allie Reynolds went undefeated in 25 straight road starts spanning the 1948 and 1949 seasons; Russ Meyer did not lose in 24 straight road contests spanning the 1953 and 1954 seasons (Elias Sports Bureau). NEAR NO-NOs: Young took a no-hitter at least 5.0 innings on three occasions in 2006...May 30 vs. Colorado, he tossed 7.0 hitless innings before Brad Hawpe broke it up with a leadoff double in the eighth...he was the first pitcher to take a potential no-hitter into the eighth in the 2006 season (Elias Sports Bureau)...in his next outing, Young did not allow a hit over his first 5.1 innings, June 4 at Pittsburgh...over the last seven seasons (2000-06), the only other pitcher to begin consecutive starts with at least 5.0 hitless innings was Steve Trachsel on June 20 and 25, 2002 (Elias Sports Bureau)...Young's deepest no-no bid came in his second start against the Pirates when he tossed 8.1 innings before surrendering a two-run home run to Joe Randa...he became the first Padres pitcher to take a no-hitter into the ninth since Andy Ashby on Sept. 5, 1997 vs. Atlanta (8.0 innings). PLAYOFF PREMIER: Picked up the win in his first career postseason appearance, starting Game 3 of the National League Division Series Oct. 7 in St. Louis...his 6.2 shutout innings led to the Padres only playoff victory in 2006...allowed four hits and two walks while striking out nine. Recorded 12 wins, matching Texas rookie record...ranked among qualifying Major League rookies in strikeouts (second, 137), wins (tied for third, 12), ERA (fourth, 4.26), starts (fifth, 31) and innings pitched (fifth, 164.2)...Was named to the Opening Day roster for the first time in his career, one of three rookies on the season-opening roster...was named the Rangers' number three starter near the end of spring training...allowed seven runs in 7.1 innings pitched (8.59 ERA) over first two starts...went 6-2, 2.18 (17 ER/70.1 IP) in 11 games/starts from April 17-June 13, lowering his ERA to season-low 2.78...went 3-0, 1.42 (4 ER/31.2 IP) in five starts in May...1.42 ERA was third-best among all qualifying major leaguers for the month...went 2-4, 9.07 (41 ER/40.2 IP) in nine games/starts from June 20-August 2, to raise ERA to 4.94...recorded a 2.53 ERA (13 ER/46.1 IP) over his final nine starts to lower season mark to 4.26...won final four decisions of the season, the longest win streak of his career...tossed season-high 8.0 scoreless innings on two occasions-May 9 vs. Detroit and August 17 at Cleveland...registered season-high 13.2 scoreless innings from May 3-9...recorded career-high eight strikeouts on June 2 at Detroit...Recorded 12 wins, matching Texas rookie record for wins, a mark also held by Edwin Correa in 1986 and Kevin Brown in 1989...ranks among Rangers' all-time rookie leaders in starts (tied for third, 31), strikeouts (fourth, 137) and innings pitched (sixth, 164.2)...posted eight wins before the All-Star break, joining Jeff Zimmerman in 1999 and Jose Guzman in 1986 as the only rookie hurlers in club history with eight wins prior to the break...Ranked fifth in the American League with 7.5 strikeouts per 9.0 innings...averaged 7.32 runs of support per start, 2nd-highest in the majors, trailing only Boston's David Wells...was named as Rangers' Player of the Month for August, going 3-1, 3.56 (13 ER/33.1) in six games/starts during the month...allowed three or fewer runs in 22 of 31 starts...Rangers were 16-15 in his starts...recorded 10 quality starts, second-best among Texas hurlers...went 5-0, 3.47 (23 ER/59.2 IP) in 11 games/starts during the day and 7-7, 4.71 (55 ER/105.0 IP) in 20 games/starts at night...has a career 8-1 record with a 3.31 ERA (30 ER/81.2 IP) in 15 day games and 7-8, 5.05 (67 ER/119.1 IP) in 23 starts at night...went 3-1, 2.59 (7 ER/24.1 IP) in four starts in interleague play...interleague ERA tied for 10th-best in the American League...held opposing batters to a .252 average, .281 (95-for-338) against left-handers and .220 (67-for-304) against right-handers...earned win on April 22 at New York (AL), becoming the fifth rookie pitcher in as many seasons to earn a win for the Rangers in Yankee Stadium...Young joined Juan Dominguez (June 5, 2004), R.A. Dickey (May 16, 2003), Joaquin Benoit (August 25, 2002) and Aaron Myette (August 2, 2001) in accomplishing the feat...tossed 7.0 scoreless innings on June 13 vs. Atlanta to earn win...retired 20 of his final 21 batters faced, including 12 straight from the 1st-5th innings...pitched a no-hitter for 5.2 innings before allowing a Craig Biggio single in the sixth inning on June 25 at Houston...earned win with 8.0 scoreless innings on August 18 at Cleveland...was club's only win on a 13-game road trip and snapped Rangers' season-high eight game losing streak...only the third rookie hurler in Major League history to end his team's losing streak of at least eight games with 8.0 or more scoreless innings...tossed just 1.0 inning in start on September 7 at Minnesota, leaving the game with arm fatigue...did not make next start until September 22 at Los Angeles of Anaheim...former Princeton student-athlete started seven games alongside former Penn infi elder Mark DeRosa...they are just the second Ivy League tandem in the last 50 years to start for the same team...Ron Darling (Yale) and Bill Almon (Brown) started alongside each other in two games for the 1987 New York Mets. Acquired from Montreal in an early April trade, Chris made his major league debut in late August and started 7 games for Texas...went 3-2 with a 4.71 ERA (19 ER/36.1 IP)...Signed a 3-year contract through 2007 on Nov. 19, 2004. Texas: Purchased from Oklahoma on Aug. 24 and made ML debut in that night's game vs. Minnesota...fell one out shy of a quality start, allowing 3 runs in 5.2 innings...exited his debut trailing 3-0 before Rangers mounted a late comeback in a walk-off 5-4 win...took loss in next start on Aug. 29 vs. Baltimore, but earned first major league win in 3rd start on Sept. 4 at Boston...allowed one run in 5.2 innings of Rangers' 8-6 victory, posting career high 5 K's...allowed 6 runs in next start and was temporarily shut down...next start came on Sept. 19 at Anaheim, earning 1-0 win with 6.0 shutout innings that day...it was the Rangers' first 1-0 victory since Aug. 25, 2000 vs. Toronto, a stretch of 669 games...beginning Sept. 19, went 2-0, 3.31 (6 ER/16.1 IP) in final 3 starts, issuing just one walk, to lower season ERA from 5.85 to 4.71...earned 3 wins for the year, T5th among Texas starters, and club went 5-2 in his starts...recorded at least 4 K's in 6 of 7 starts...opponents batted .250, .153 (11-72) vs. lefties and .347 (25-72) against right-handers. Minors/Trade: Was acquired from Montreal along with C/IF Josh McKinley for C Einar Diaz, LHP Justin Echols and cash considerations on April 3...combined to go 9-5, 3.72 (49 ER/118.2 IP) in 23 games/starts for Frisco (AA) and Oklahoma (AAA)...went 6-5, 4.48 (44 ER/88.1 IP) in 18 games/starts with the RoughRiders...opened the season with Frisco, going 1-3, 5.97 (21 ER/31.2 IP) in his first 7 starts in the Texas organization...went 2-0, 2.25 (4 ER/16.0 IP) over his next 3 starts to finish the month of May...allowed 5 runs (4 earned) in 4.1 IP in loss on June 5 vs. San Antonio...over next 6 starts, went 3-1, 2.67 (10 ER/33.2 IP)...allowed 5 runs in 2.2 innings in final Frisco start on July 21 at San Antonio...recorded 8 K's in May 9 win vs. El Paso, most strikeouts with Frisco...issued just 2 home runs in final 12 starts and 61.0 innings with RoughRiders, both coming in July 3 win vs. Round Rock...promoted to Triple-A in late July and went 3-0, 1.48 (5 ER/30.1 IP) in 5 games/starts for Oklahoma...over last 2 starts, was 2-0, 1.38 (2 ER/13.0 IP) with 18 K's and 2 walks...was named PCL Pitcher of the Week for Aug. 16-22 after last outing on Aug. 18 (G2) at Memphis (7.0 IP, 2 H, 1 RER, 1 BB, 9 SO)...with RedHawks, issued just 9 walks with 34 strikeouts and held opponents to a .189 (20-106) average...4 of his 5 starts with Oklahoma were quality starts, allowing just 2 runs in the other start...club was 4-1 in his PCL starts, only loss coming Aug. 7 vs. Tacoma, when RedHawks had a 4-2 lead in the 9th before bullpen blew lead...in 2nd career Triple-A start on Aug. 2 at Sacramento, took a no-hitter into the 6th inning before allowing a leadoff double. Ivy Leaguer: With ML debut on Aug. 24, Young became the first Princeton product to start a major league game since Dave Sisler on Aug. 27, 1961 (G2) for the Washington Senators against Detroit, nearly 43 years to the day...the previous Princeton Tiger to appear in a ML game was pitcher Robert Tufts, who was a reliever from 1981-83...Young joins only 2 other known Rangers with Ivy League roots...right-handed pitcher Pete Broberg, who was with Texas from 1972-74, attended Dartmouth...outfielder Doug Glanville, who played for the Rangers in 2003, went to Penn. Other Notes: Young graduated from Highland Park HS, located just north of downtown Dallas, where he was all-state in basketball and baseball...at 6 feet, 10 inches tall, Chris Young is the tallest pitcher in club history...previous tallest was right-handed pitcher Mike Smithson at 6'8" tall. Began the season on the disabled list before joining Single-A Brevard County in late April...went 5-2, with a1.62 ERA (9 ER/50.0 IP) in eight games/starts...was 3-0, with 0.47 ERA (1 ER/19.0 IP) in first three outings in Florida State League...tossed season-high 8.0 shutout innings in final start of that stretch on May 11 at Ft. Myers, allowing just one hit with no walks and eight strikeouts...pitched 6.0 or more innings in six of eight appearances for Brevard County...FSL opponents batted just .150 (26-for-173)...promoted to Double-A Harrisburg in mid-June and went 4-4, 4.01 (37 ER/83.0 IP) in 15 games/starts in his Double-A debut...went 3-1, 3.03 (10 ER/29.2 IP) over five starts in July...had a 2.31 ERA (3 ER/11.2 IP) over final two starts, dropping season figure from 4.29 to 4.01...matched season high with eight strikeouts in final outing on August 30 at Norwich...tossed 7.0 shutout frames in win on July 27 vs. Reading. Spent entire season with Single-A Hickory in the South Atlantic League, helping the Crawdads to league title...went 11-9, with a 3.11 ERA (50 ER/144.2 IP) in 26 games/starts...went 9-3, 2.34 (20 ER/77.0 IP) in first 14 starts through June 14...did not allow a run in five of those starts...took a decision in 15 consecutive outings from April 16-July 4...allowed three or fewer runs in each of his last four losses...allowed more than three earned runs in justtwo of 26 starts...opposing batters hit .234 (127-for-543)...after the season was traded to Montreal with Jon Searles for pitcher Matt Herges. Drafted by Pittsburgh in third round of the 2000 June draft...signed the following September and began his professional career at Hickory...went 5-3, 4.12 (34 ER/74.1 IP) in 12 games/starts...threw two complete games. 1999-2000: In baseball in 2000, was league's leading pitcher with a 1.82 ERA overall and 1.05 figure in Ivy games (Princeton University)...posted a perfect record of 5-0 in eight appearances, with 52 strikeouts in 49.1 innings...was a unanimous first-team All-Ivy League baseball selection...in basketball, was only player on per game in Princeton's seven games against NCAA tournament teams, including 20 at Kansas...had careerhigh 30 points against Harvard...scored in double figures 22 times...set a school record with 88 blocked shots, breaking his own record of 55...set school record with nine blocked shots against Ohio...made 15 of last 45 three-point attempts...led team in scoring (13.8 points per game), rebounding (6.3 per game, the most by a Princeton player since 1978), blocked shots (a school record 87) and steals (40) and was second in assists (105, the 13th player in school history to reach 100)...started every game in his career...finished career with 801 points, 350 rebounds and 142 blocks. 1998-99: The unanimous Ivy League Rookie of the Year in both baseball and basketball, the first male in league history to accomplish the feat in two sports...led the baseball squad and league with a 2.38 ERA...surrendered only nine earned runs in 34.0 innings...allowed one home run against 150 batters faced...named second-team All-Ivy in basketball...a nine-time Ivy League Rookie of the Week (seven times in basketball, twice in baseball)...was basketball Rookie of the Week each of the final six weeks...was named Ivy League Player of the Year and a freshman All-America by Basketball Weekly...set Princeton freshman records for points (387) and rebounds (160)...averaged 12.9 points and 5.3 rebounds...shot 62% (23-for-37) in three NIT games...scored in double figures 21 times, including each of the final 11 and 17 of the final 19...had season-high 24 in NIT win at North Carolina State...had 39 points, 19 rebounds and 15 assists in three games at the Rainbow Classic. Are you younger than MLB's 10 oldest players? March 31, 2018 El Paso Chihuahuas released RHP Chris Young. January 18, 2018 RHP Chris Young assigned to El Paso Chihuahuas. December 22, 2017 San Diego Padres signed free agent RHP Chris Young to a minor league contract and invited him to spring training. June 24, 2017 Kansas City Royals released RHP Chris Young. June 23, 2017 Kansas City Royals designated RHP Chris Young for assignment. May 28, 2016 Kansas City Royals activated RHP Chris Young from the 15-day disabled list. December 7, 2015 Kansas City Royals signed free agent RHP Chris Young. November 2, 2015 RHP Chris Young elected free agency. March 7, 2015 Kansas City Royals signed free agent RHP Chris Young. October 30, 2014 RHP Chris Young elected free agency. March 27, 2014 Seattle Mariners signed free agent RHP Chris Young. March 25, 2014 Washington Nationals released RHP Chris Young. November 20, 2013 RHP Chris Young assigned to Syracuse Chiefs. November 13, 2013 Washington Nationals signed free agent RHP Chris Young to a minor league contract and invited him to spring training. November 4, 2013 RHP Chris Young elected free agency. September 16, 2013 Syracuse Chiefs activated RHP Chris Young from the 7-day disabled list. September 3, 2013 Syracuse Chiefs sent RHP Chris Young on a rehab assignment to Auburn Doubledays. August 27, 2013 Syracuse Chiefs sent RHP Chris Young on a rehab assignment to GCL Nationals. May 28, 2013 Syracuse Chiefs placed RHP Chris Young on the 7-day disabled list. April 23, 2013 Syracuse Chiefs activated RHP Chris Young. April 4, 2013 Washington Nationals signed free agent RHP Chris Young to a minor league contract. April 4, 2013 RHP Chris Young assigned to Syracuse Chiefs. April 4, 2013 Chris Young assigned to Auburn Doubledays from Syracuse Chiefs. March 26, 2013 Washington Nationals released RHP Chris Young. February 21, 2013 Washington Nationals signed free agent RHP Chris Young to a minor league contract and invited him to spring training. February 21, 2013 Chris Young assigned to Syracuse Chiefs. November 3, 2012 RHP Chris Young elected free agency. June 8, 2012 New York Mets activated RHP Chris Young from the paternity list. June 5, 2012 New York Mets selected the contract of Chris Young from Buffalo Bisons. May 27, 2012 Chris Young assigned to Buffalo Bisons from St. Lucie Mets. May 10, 2012 Chris Young assigned to St. Lucie Mets from Buffalo Bisons. April 5, 2012 Chris Young assigned to Buffalo Bisons. March 25, 2012 New York Mets signed free agent RHP Chris Young to a minor league contract. October 30, 2011 RHP Chris Young elected free agency. June 3, 2011 New York Mets transferred RHP Chris Young from the 15-day disabled list to the 60-day disabled list. April 26, 2011 New York Mets activated RHP Chris Young from the 15-day disabled list. April 16, 2011 New York Mets placed RHP Chris Young on the 15-day disabled list retroactive to April 11, 2011. Right biceps tendinitis. January 20, 2011 New York Mets signed free agent RHP Chris Young. November 7, 2010 RHP Chris Young elected free agency. September 18, 2010 San Diego Padres activated RHP Chris Young from the 60-day disabled list. September 10, 2010 sent RHP Chris Young on a rehab assignment to Lake Elsinore Storm. August 30, 2010 sent RHP Chris Young on a rehab assignment to Portland Beavers. May 17, 2010 San Diego Padres transferred RHP Chris Young from the 15-day disabled list to the 60-day disabled list. May 2, 2010 San Diego Padres sent RHP Chris Young on a rehab assignment to San Antonio Missions. April 12, 2010 San Diego Padres placed RHP Chris Young on the 15-day disabled list retroactive to April 7, 2010. Tightness in his right shoulder. October 28, 2009 San Diego Padres activated RHP Chris Young from the 60-day disabled list. July 31, 2009 San Diego Padres transferred RHP Chris Young from the 15-day disabled list to the 60-day disabled list. June 19, 2009 San Diego Padres placed RHP Chris Young on the 15-day disabled list retroactive to June 15, 2009. Inflamed right shoulder.